Partnering with TAFE Queensland Brisbane, industry demand for qualified chefs will be met with two acclaimed Le Cordon Bleu programmes offered at TAFE Southbank Campus: Diplôme de Cuisine (Certificate III in Commercial Cookery) and Diplôme de Pâtisserie (Certificate III in Pâtisserie). The Brisbane institute is the latest addition to Le Cordon Bleu Australia with schools in Melbourne, Sydney, Perth and Adelaide, and 35 institutes worldwide. 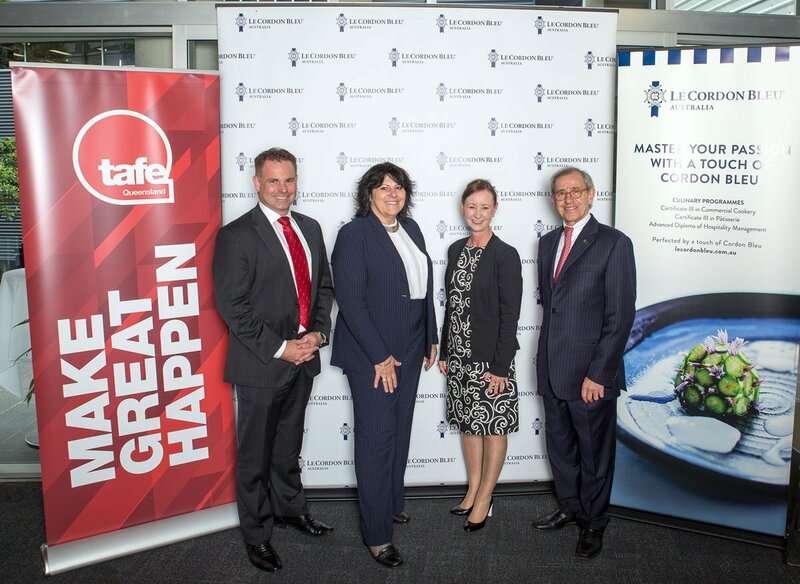 Le Cordon Bleu Australia hosted a small signing ceremony recently to mark the new partnership with TAFE Queensland Brisbane to deliver the programmes at TAFE Southbank Campus. The ceremony was attended by M. André Cointreau (President, Le Cordon Bleu International), Yvette D’Ath (Minister for Training and Skills), Mary Campbell (TAFE Queensland Interim Chief Executive Officer), Jessica Mahn (Chief Operating Officer, LCB International), Derrick Casey (Chief Operations Officer, (Le Cordon Bleu Australia), Nick Gurner (Director, Le Cordon Bleu Australia) and TAFE Queensland representatives. "The new Le Cordon Bleu Institute in Brisbane will provide a stream of highly motivated and qualified professional chefs for the expanding industry in Queensland. With training due to commence in July 2018, the delivery of the new programmes is well-timed to take advantage of Brisbane’s burgeoning business events and tourism sector energised by the 2018 Gold Coast Commonwealth Games." Tourism in Brisbane is expected to grow significantly following the Commonwealth Games, with business conferences bringing international visitors to local hotels, restaurants and cafes. Over the next decade the number of international and domestic visitors to Brisbane will expand to 9.3 million each year, with a total economic impact of $7.9 billion1. With $6 billion worth of tourism projects underway, a $3 billion development at Queens Wharf will require 8000 employees within the next five years2. Brisbane City Council predicts an overall 32,500 increase in employees in the CBD to 182,252 by 20313. The influx of local and international visitors indicates that there will be a high demand for qualified chefs in Queensland’s hotels, restaurants and cafés. Le Cordon Bleu with TAFE Queensland will provide new opportunities and increased services as both organisations leverage their collective size and expertise to service the needs of the hospitality and tourism industry in Queensland, Australia and internationally.